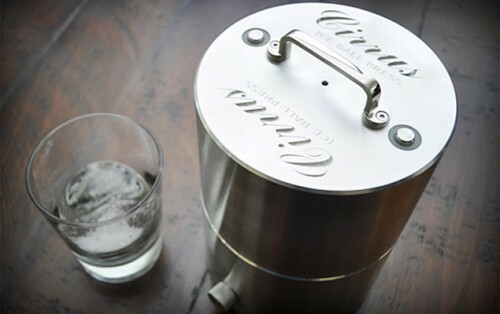 Expensive Liquor Calls For Something Like This Ice Ball Press | OhGizmo! Announcing The Winner Of The TimeCommand Giveaway! Like any self-respecting gents, we here at OhGizmo! headquarters like to consume fine Scotch Whisky… We of course consume other libations indiscriminately, provided they nudge you steadily closer to inebriation. This squarely puts us into the field of liquor noobs; aside from James Bond’s allusions to drink preparation methods, little did we know how much care can go into fixing a proper intoxicant. Apparently, large spheres of ice are becoming popular in certain bars as they provide the smallest surface area against which to cool your expensive distillate, preventing rapid dilution. Until recently these bars would assign ice-carving bartenders the task of chiseling out spheres one at a time. Devices like this Ice Ball Sphere press seek to make their life easier. It consists of two metal masses with a spherical depression in the middle. Place a chunk of ice in the lower half-spherical hole, insert top half into the guide-rails and gravity will pull the mass down, melting the ice rapidly until a ball shape is achieved about a minute later. It’s $800 and clearly aimed at bars, though you could of course buy it for your own home. It might go well with that fancy toothpaste squeezer. Hit the jump for a video and links. 800 dollars and it takes over 50 seconds? I will stick with my 20 dollar whiskey stones that don’t dilute the drink AT ALL. if you just designed that thing which would be pretty easy you could probably get a machinist to build it for less than 300 dollars and make it look cooler/custom to you with your name even on it……….